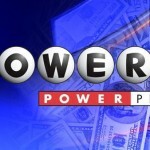 Soon after the largest Powerball jackpot in the history of the game was won, three soldiers from Fort Lee won a $1 million Powerball prize that will be split three ways. 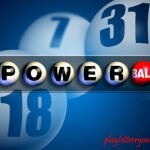 They came painfully close to winning the jackpot as they failed to match the Powerball number which was 31. 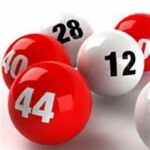 The other five regular numbers that the three soldiers had on their lottery slip were 17, 29, 31, 52 and 53 and for their performance each will receive an equal amount of $333,333. This sum is subject to taxation and the winners will end up receiving slightly less than $300,000, and won’t get to decide between the annuity or the lump payment. 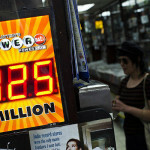 There are various lottery strategies that players frequently use and some go to great lengths to find intricate systems that are allegedly more effective. Others prefer the Quick Pick feature, but the three soldiers who won the million dollars kept playing the same six numbers over and over again. When asked whether these numbers bear any significance to them, they said that they were randomly chosen and the group decided to stick to them. It was obviously a smart choice because otherwise they wouldn’t be now posing for photographs and waiting to receive $333,333 each. Given the fact that they have an active status in the military, as a part of the Tango Company, the three winners won’t get to spend their money right away. They need to follow procedure and stick to the 266th Quartermaster Battalion but fortunately for them, time is not of the essence and they will get to enjoy their newfound wealth. The amount is not a life-changing one, but having a few hundred thousand dollars in their pocket is definitely refreshing and should increase their optimism level. The beauty of lottery games is that it makes no difference whether you had been playing for years or have purchased the first ticket ever. This group provides us with the ultimate example, as Sergeant First Class Robert Gallow joined his two comrades only two days before the draw. Staff sergeants David Jenkins and Nathan Sutherland have been playing the same numbers for more than a year, and Gallow decided to give it a try as well. Making him a part of the group proved to be lucky, as this was the first prize ever to be won by the two staff sergeants. 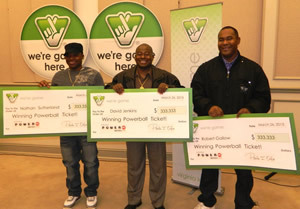 There are no hard feelings and the two soldiers don’t have any regrets about the fact that the money will be split three ways instead of being shared by the two veteran lottery players. There were collateral winners because in addition to the three soldiers, the Tobacco Zone store owner in Hopewell will also receive $10,000. This is the reward that the lottery presents to the one selling the winning ticket. 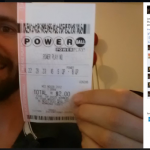 Check out Powerball jackpot finally won by New Jersey player now.